...yet what's even more striking is that both reports have come from the same place: American Catholicism's marquee diocese. In a letter made public this Halloween morning, Cardinal Timothy Dolan of New York informed his priests and people that an abuse claim against Auxiliary Bishop John Jenik, 74 (above), had been deemed founded by the archdiocese's Lay Review Board. While the Chancery's announcement didn't specify the nature of the allegation, Whispers has learned that Jenik was accused of abusing a 16 year-old boy; a subsequent report in the New York Times said the cited misconduct dates to the 1980s. Under normal circumstances, Jenik would be permanently removed from ministry upon the lay panel's judgment. 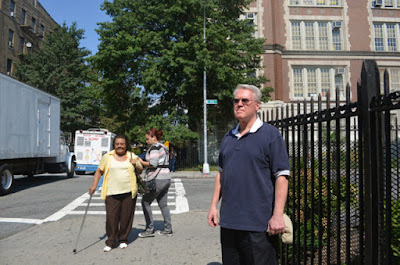 However, as the prelate immediately signaled his intent to appeal the finding to the Vatican, Dolan said that the auxiliary has "step[ped] aside" from his diocesan roles and his four-decade post as pastor of Our Lady of Refuge parish in the Bronx pending the outcome of the Roman process. Having been given permission to send a letter of his own to his parishioners, the bishop said he "steadfastly den[ied] that I have abused anyone at any time." 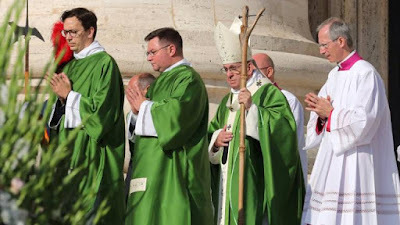 On a key context note, as has become a prominent critique of the US church's 2002 abuse procedures over recent months, bishops are exempt from the protocols of the Dallas Charter and Norms, so the local investigation – only the second known instance of a diocesan investigation on an allegation against a prelate – would've required the permission of the Holy See before it could proceed. 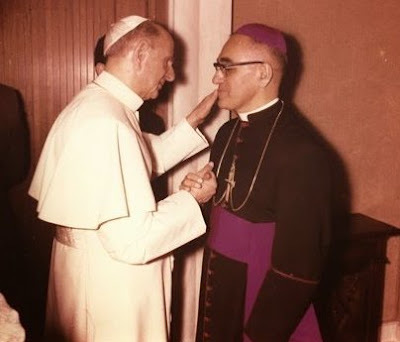 Accordingly, any binding judgment on Jenik's status would've rested with Rome regardless as bishops – even auxiliaries – are canonically answerable to the Pope alone. In that light, despite today's move, Jenik remains an active auxiliary of New York unless and until Francis accepts his resignation from the post. Long revered among the Gotham crowd as a heroic pastor amid the drug-and-crime-plagued "war zone" of the Bronx, Jenik was one of the three septuagenarian lifers in the trenches named as deputies to Dolan in mid-2015 by Pope Francis. 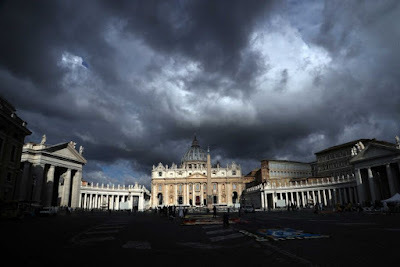 With some 2.6 million Catholics, New York is the US' second-largest diocese, but nonetheless its most prominent given the Big Apple's concentration of financial, media and geopolitical heft – a mix which has long seen the Vatican consider the city as the "Capital of the World." 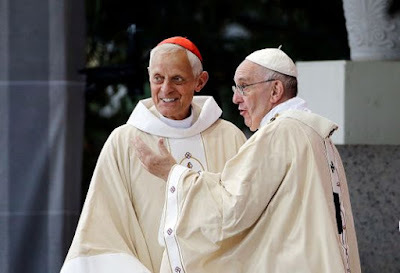 Unlike last summer's watershed allegation against the long-retired Archbishop Theodore McCarrick – which resulted in the New York native's historic July resignation from the College of Cardinals – given Jenik's far more recent elevation, the accusation of an active prelate places the current appointment process for bishops under fresh scrutiny, especially as a more thorough vetting of candidates has long been seen as a concrete outcome of the 2002 tidal wave, which saw a half-dozen US prelates forced from office over decades-old, but freshly-unearthed abuse reports. 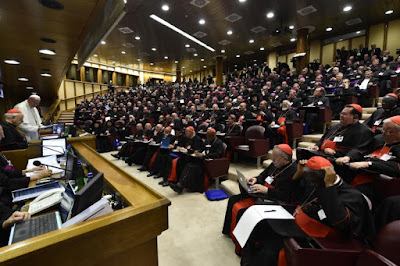 In addition, the development further roils an already scorched ecclesial landscape all of ten days out from a USCCB November plenary in Baltimore whose emotional charge is already running high, but whose substantive outcomes remain anyone's guess. 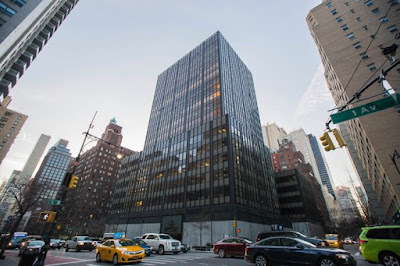 As with the accusation that felled McCarrick, the Jenik claim was brought to the New York church through the archdiocese's Independent Reconciliation and Compensation Program (IRCP) – a Dolan-chartered initiative that's seen his First Avenue Chancery leverage at least $100 million of its sizable real-estate holdings in the hope of resolving potential abuse suits through out-of-court mediation. In its first round last year, IRCP reached $40 million in settlements of some 200 cases; this year's figures on payments and numbers of allegations remain to be released. Last month, New York was an early entry among what's become more than a dozen US jurisdictions whose top prosecutors have opened statewide investigations of abuse and its cover-up in the church since August's staggering Pennsylvania grand-jury report, the nation's first civil probe that stretched across multiple dioceses. 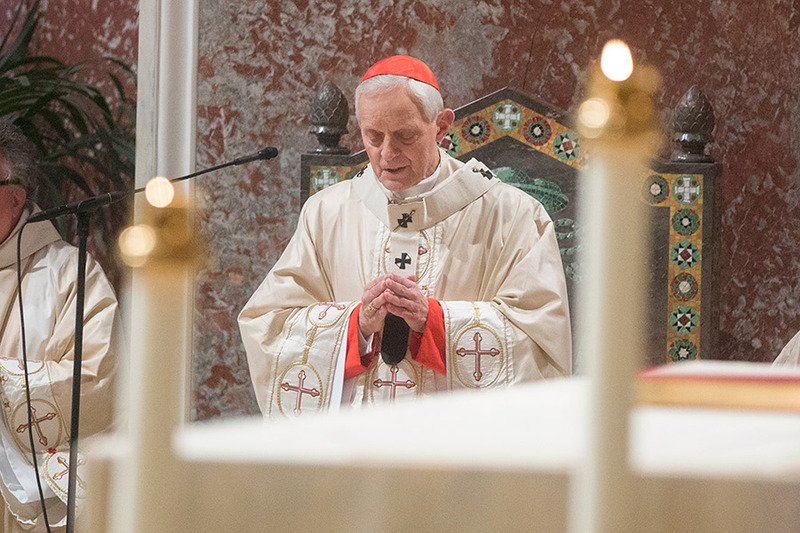 Alongside the state inquest, the cardinal named a retired Federal judge as an internal "special counsel" to review the archdiocese's files and procedures for the handling of cases. Expanding PA Probe, Feds Warn US Church: "All Your Files Are Belong To Us"
As this scribe's routinely said among friends over these last four months, "Every time you turn around, something else blows up...."
...yet when this readership gets jumpy about the last thing that went off, that only shows an ignorance about the next one. If you could, folks, please keep that in mind – this is a long ride, with no end in sight. 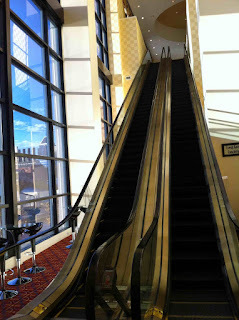 Along those lines, over the last 48 hours, many of you have had Memphis on your lips given Wednesday's striking removal of Bishop Martin Holley – given his steadfast refusal to resign, the first such Roman ouster of a US prelate in living memory – followed quickly by the deposed prelate's even more breathtaking self-immolation in an interview published late Thursday by Catholic News Agency. A week since initial word emerged of the US Department of Justice's most sweeping investigation to date into abuse and its cover-up, as an extension into the Feds' nascent grand-jury probe of the dioceses of Pennsylvania, every last Stateside Chancery has now received an effective nationwide order "to not destroy, discard, dispose of, delete, or alter" a host of records pertaining to personnel in general, and abuse – and its related claims – in particular. 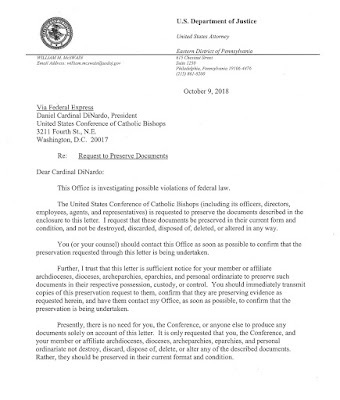 Dated October 9th – the same day the FBI swooped in with subpoenas for the clerical files of Pennsylvania's eight Latin-church dioceses and two Eastern archeparchies – the letter was privately circulated to the nation's hierarchy by the US Conference of Catholic Bishops on Tuesday, 23 October, and has duly spread since among internal counsels and personnel-chiefs across the Stateside church's 198 jurisdictions. 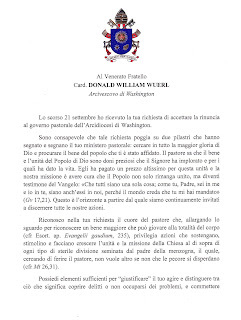 Addressed to the bench's president, Houston's Cardinal Daniel DiNardo, the "requested" national "hold" of documents was signed by William McSwain, the Trump-appointed US Attorney for the Eastern District of Pennsylvania, whose Philadelphia-based office has launched the historic investigation – believed to be the first such inquest seeking to put the church under the microscope of the Federal "RICO" laws: the racketeering statutes usually reserved for organized crime. 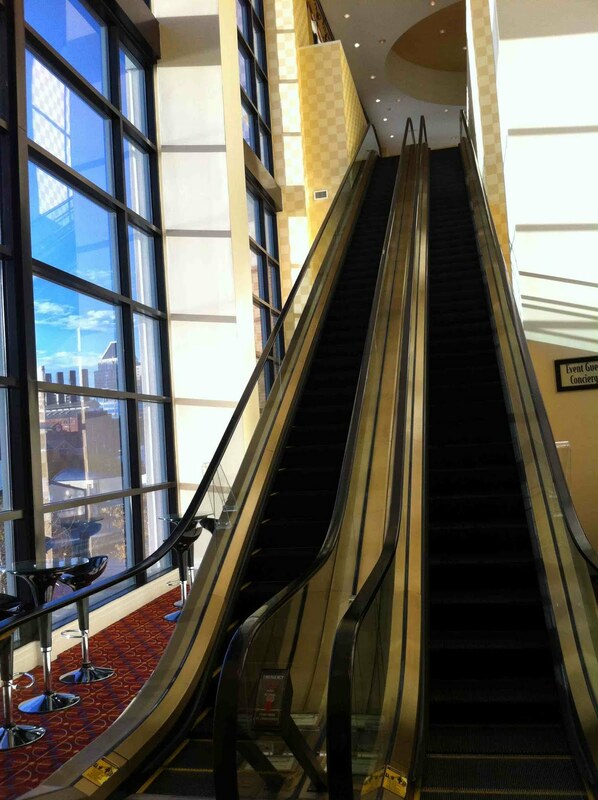 Originally slated for Wednesday of this week, house ops report that the first appearance of the Pennsylvania bishops before the Federal panel has been slightly delayed. 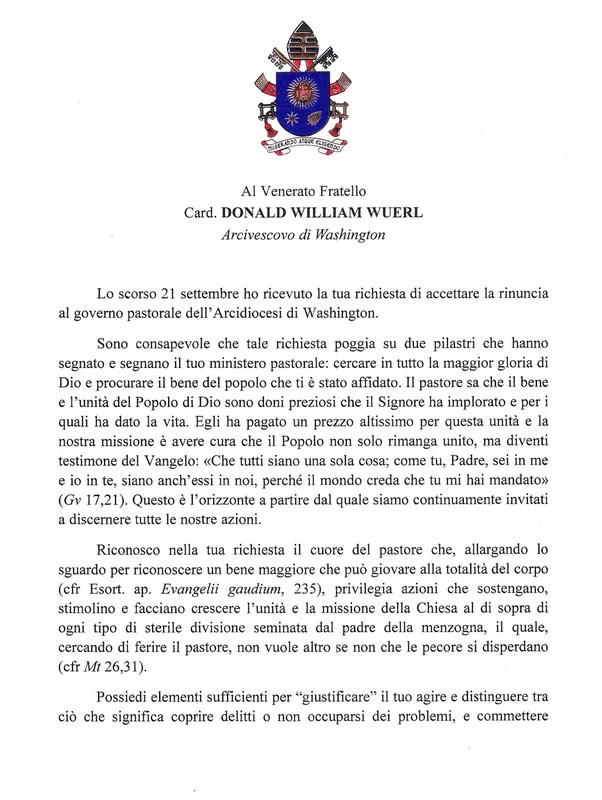 Meanwhile, given the lack of civil or canonical jurisdiction the DC Mothership has over the local churches – an issue likewise relevant to the coming debates over prelates' accountability apart from the oversight of the Holy See – it bears noting that legal disputes over the force of any request to the USCCB have already flared up anew in Chanceries and beyond. Nonetheless, as it's the Feds calling, to an unprecedented degree, the warning is served. 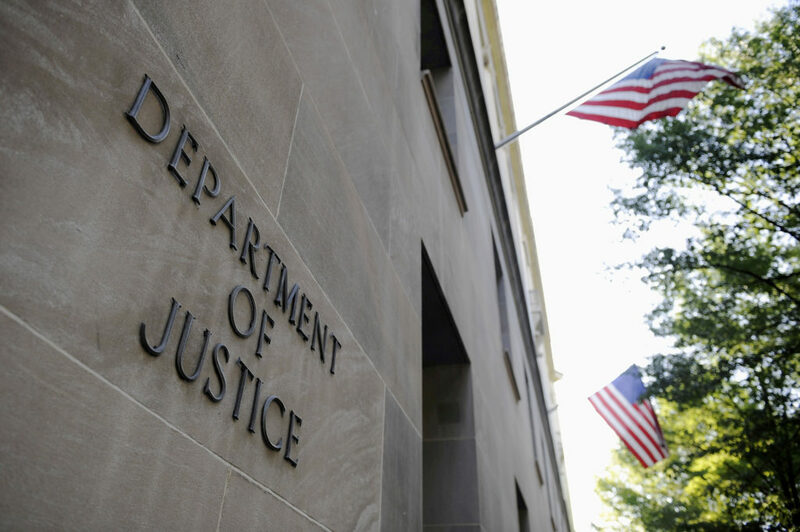 Keeping with the Justice Department's usual practice, the US Attorney's Office in Philadelphia routinely refuses to "confirm or deny" the existence of the Pennsylvania investigation, its explicit communication on the case only to occur if and when indictments are produced. With less than three weeks until a November meeting that's arguably even more consequential than its seismic 2002 predecessor in Dallas – and amid a fraught planning that's come under pointed criticism from no shortage of fronts – this afternoon brought another sudden development in the gradual response of the US bishops: the Mothership's announcement that the bench would convene for a weeklong retreat at Chicago's Mundelein Seminary (above), beginning on January 2nd. 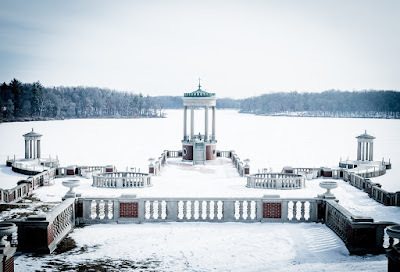 Given the lack of feasibility of nixing the Fall Classic due to its years-in-advance hotel bookings – and with it, the untold funds already spent on the arrangements – the move to gather at Chicago's "Enchanted Forest" seminary in quite penitential weather doesn't just represent a lightning-speed response as the bench's usual timing goes, but is essentially a response as close to the spirit of Francis' request as the pinnacle of American Catholicism's institutional behemoth could ever hope to muster. In today's invitation letter to the prelates – which, without explicitly saying so, repeatedly indicated the "command performance" nature of the event – the conference president, Houston's Cardinal Daniel DiNardo, revealed that the Pope "has kindly offered" the Vatican's lead in-house homilist, Capuchin Fr Raniero Cantalamessa, to lead the retreat. As if the exercise itself wasn't going to be interesting enough. 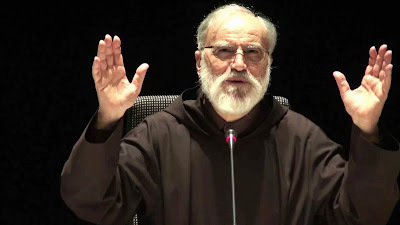 No stranger to controversy, over his nearly four decades as preacher of the Papal Household – a post seen by the world only on Good Friday, but likewise tasked with giving the pontiff's private Friday reflections in Lent and Advent – the 84 year-old friar (long a favorite of the church's Charismatic movements and frequent visitor to the States) has compared the world's focus on the abuse scandals to "the more shameful aspects of anti-Semitism," equated the 2006 film release of the The DaVinci Code to Judas' betrayal of Jesus, and infuriated traditionalists with an homage to the late Sulpician biblicist Fr Raymond Brown as "the greatest scholar of the Passion." 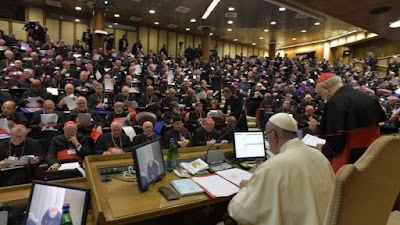 At the same time, however, in a late 2005 sermon (read: to Benedict XVI), Cantalamessa lamented over how the church's "immense doctrinal edifice" obscures its Lord, calling attempts to enforce Catholic teaching in an unevangelized world as akin to "putting one of those old heavy brocade capes all of a sudden on the back of a child," while telling Francis' Curia eight years later that humility "is possessed by those who think they do not have it, and it is not possessed by those who think they have it." To be sure, the Raniero Desk doesn't lack for "greatest hits." Still, regardless of what one makes of the man and the moment, this much is clear: amid January's bitter cold, the preacher comes to Chitown as the Pope's agent, and with him, a heavy focus on both the central role of the Holy Spirit in ecclesial renewal – at least, if He's given space to work – as well as a Franciscan "stripping" of ecclesiastical decadence is to be expected. "One of the factors of the obscuring of the Gospel was the transformation of authority understood as service to authority understood as power, which produced infinite conflicts within and outside the Church...."
On a couple related context fronts, the January retreat will open a calendar year whose end already has another big bang lined up: the previously-broken ad limina visit of the entire US episcopate, which is slated to unfold over a matter of weeks in November and December 2019. While the last four months have already put the Stateside church under heavy focus in Rome and beyond, only the year-end pilgrimage will mark the national fold's – and its leaders' – first in-depth Vatican "physical" of Francis' pontificate. And lastly, confirming Whispers' reporting over the weekend, DiNardo told the USCCB-owned Catholic News Service yesterday in Rome that the opening Monday of the 12-15 November meeting in Baltimore will be given to a communal time of "prayer, penance and fasting" for the bishops; again, the form and speakers for the Floor sessions remain in the works. BOSTON – As it happens, the scribe’s on the road this week for a mix of talks and taking soundings... all the while, however, the story Whispers has been reporting as time allows has now broke into the open. Whispers has been working this story for the last week... per house ops, FBI served subpoenas to PA dioceses – as one put it, “ALL of us” – last week; bishops called to court next week. As ever – but here, even more than usual – stay tuned. 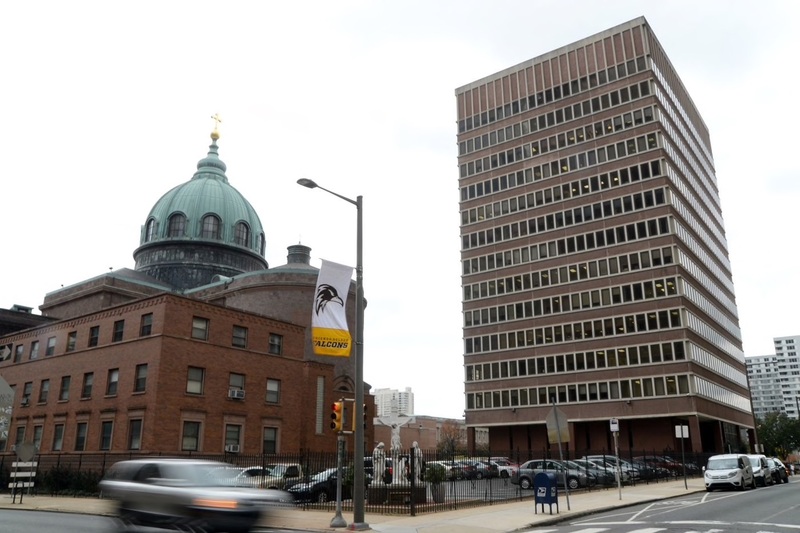 SVILUPPO: In a rare privilege for a non-member of its crew – even more a blessing given the road schedule – this scribe's first full report on the nascent investigation was given live over the airwaves of Philadelphia's venerable KYW NewsRadio. 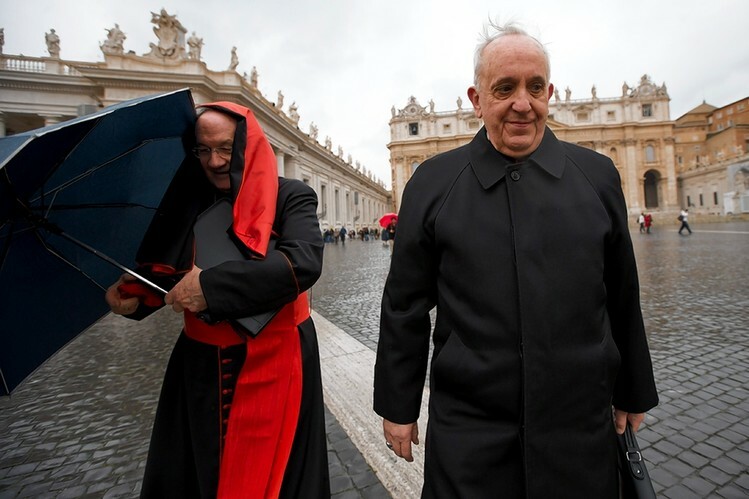 Their reports normally kept to taped 30-second spots, at least for a church story, 1060 hasn't had a moment of this kind since 20 minutes after the resignation of Benedict XVI. In Seven New Saints, "The Passion to Risk Everything And Leave It All Behind"